Munich, New York, San Francisco and Beijing – four destinations on three continents in five days: The BMW Group is teaming up with Lufthansa Cargo to present the BMW Vision iNEXT World Flight as part of an event unparalleled in its execution. More than 300 international media representatives will board on the most advanced and efficient cargo aircraft in its class – a Boeing 777F from the Lufthansa Cargo fleet – to experience for the first time the vision of future mobility embodied by the BMW Vision iNEXT, the latest Vision Vehicle from the BMW Group. Lufthansa Cargo and the BMW Group team have worked together closely to turn this extraordinary vehicle and technology presentation from idea into reality. The assembled guests will be introduced to the pioneering vehicle and given a preview of the BMW Group’s future as part of an exclusive closed room concept specially conceived and designed for the occasion. Preparations for the presentation event will involve laying more than 7.5 km of wiring, while 78,000 LEDs in 165 video LED modules and ten 13,000 ANSI lumen projectors will light up a show inside the Boeing aircraft that appeals to all the senses. More than 120 specialists in exhibition stand construction, as well as experts from Lufthansa Cargo and the BMW Group have played their part in making the project happen. Around 30 tonnes of material will be used to construct a suitable platform on which to showcase the BMW Vision iNEXT. The challenge for the various engineers and specialists has involved not only staging a presentation the likes of which none of those present will have witnessed before, but also ensuring their creation would literally “take off”. Timings will be tight, given the need to turn the entire set-up inside the 777F from presentation mode to flight mode and back quickly and securely. The first guests are expected to arrive eight hours after the plane lands. And just four hours after the final presentation has been wrapped up at one venue, the Boeing will take off again for the next destination on its itinerary. This technical and logistical tour de force will underpin a vehicle and technology presentation that is genuinely unprecedented. The aircraft’s exterior makeover takes its cues from the interior design created for the vehicle presentation. 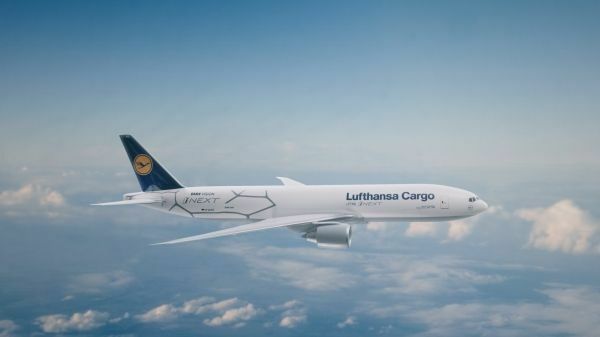 And this will be the livery adorning Lufthansa Cargo’s Boeing 777F when it takes off from Munich Airport on 9 September on its round-the-world flight. After calling in at New York, San Francisco and Beijing, the aircraft is due to touch down again in its home base Frankfurt on 14 September.